War is on the minds of all Americans today. Like it or not, we are at war with Islamist terrorists in Afghanistan and Iraq. 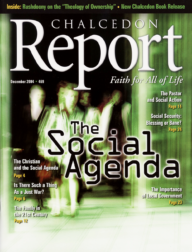 The Bible-believing Christian must boldly, loudly and unashamedly insist that the social agenda of the newly re-elected Bush administration be founded on the written Word of God. Why? And so, as we set our priorities and plans for the 21st Century, we must be certain that our definitions of marriage and family are, in fact, Biblical. When it comes to Christians taking action to change society, the role of the pastor is critical. If Christian social action is to be godly and effective, the pastor must play his part well. How can a Christian take a stand on issues and put godly pressure on the political system? We are all familiar with the saying that America is a nation of immigrants. “People get the government they deserve.” This statement is true. An ungodly people get an oppressive and ungodly government. Social Security: Blessing or Bane? Is there a better way than Social Security of providing for one’s old age? And can we find it in the Bible? If you’re old enough to remember the way America used to be, you probably remember a “Christian” country and wonder what happened to it. Why isn’t it a Christian country anymore?